Range of Stainless Steel pipes according to ANSI/ASME 36.19M - Stainless Steel Pipe. For full table with Schedule 80S - rotate the screen! Engineering ToolBox, (2003). 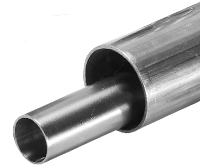 Stainless Steel Pipes - Dimensions and Weights ANSI/ASME 36.19. [online] Available at: https://www.engineeringtoolbox.com/ansi-stainless-steel-pipes-d_247.html [Accessed Day Mo. Year].